Ramos, E.L.; Llinas-Audet, Xavier; Jesús Barrena-Martínez; Hernando, J. The relevance of higher education institutions (HEI) for social development is unquestionable because of their potential for contributing intellectual solutions for the social, economic, and environmental welfare of society. 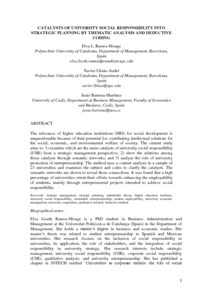 The current study aims to: 1) examine which are the main catalysts of university social responsibility (USR) from a strategic management perspective; 2) show the relations among those catalysts through semantic networks; and 3) analyse the role of university promotion of entrepreneurship. The method uses a content analysis in a sample of 23 universities and examines the subject and codes to clarify the catalysts. The semantic networks are shown to reveal these connections. It was found that a high percentage of universities orient their efforts towards enhancing the employability of students, mainly through entrepreneurial projects intended to achieve social responsibility. Ramos, E.L., Llinas-Audet, Xavier, J. B. Catalysts of university social responsability into strategic planning by thematic analysis and deductive coding. "International journal of entrepreneurship and innovation management", 10 Febrer 2019, p. 1-28.